In the June issue of Growth Stock Confidential, I took a look at a major global macroeconomic trend – the spread of air conditioning around the world. It looked like an investment opportunity and, after further research, I decided it definitely is. 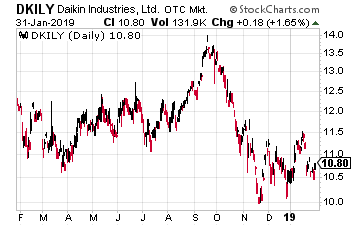 So we added the world’s largest air conditioner manufacturer (Daikin Industries – [OTC: DKILY] as measured by sales, to the portfolio. We’ve all heard the saying “it’s not the heat, it’s the humidity.” Well, that actually how air conditioning got invented. It was 1902 and the workers at Sackett & Wilhelms Lithographing & Printing Company in New York City were fed up with the muggy summer air, which kept warping their paper and ruining their prints. The company desperately needed some sort of humidity-control system. So it turned to a young engineer by the name of Willis Carrier. He invented a system to circulate air over coils that were cooled by compressed ammonia. The machine worked beautifully, allowing the lithographers to print without fear of sweaty pages and runny ink. That gave Willis Carrier an even bigger idea, recognizing that a device to control humidity had even more potential to control heat. As you can guess from his name, he went on to mass-produce the first modern air-conditioning unit at his Carrier Corporation and the rest is, as they say, history. Air conditioning went on to change the world. In fact, it is featured prominently in a great book by economist Tim Harford (who also is a columnist for the Financial Times) titled Fifty Inventions That Shaped the Modern Economy. And it still is shaping the global economy. The need for air conditioning was shown by a study released in July from the non-profit Sustainable Energy for All group. The study said that more than a billion people are at risk from a lack of air conditioning and refrigeration (another growth area) to keep them cool and to preserve both food and medicines. The study specifically pointed to about 1.1 billion people in Asia, Africa and Latin America – 470 million in rural areas and 630 million slum dwellers in cities – that were at risk among the world’s 7.6 billion people. The United Nations health agency says that heat-related stress is likely to cause 38,000 extra deaths annually worldwide between 2030 and 2050. To meet this increasing demand for cool air, we will need not only a lot more air conditioners, but also a lot more energy. A recent study by the University of Birmingham in Britain projected that the number of cooling appliances could quadruple by 2050 to 14 billion worldwide, driving a surge in energy consumption. Japan has 90 residential air conditioning units for every 100 people; India has 1 per 100. South Korea has twice the number of residential air conditioners as Brazil, which has more than four times as many people. The U.S. has more than a thousand times as much cooling output per person as India does. And to give you an idea of how much energy will be needed when these developing countries develop enough to have widespread air conditioning, just look at China. Its electricity consumption for air conditioners soared 68-fold from 1990 to 2016! The IEA warned that over the next 30 years, air-conditioning may increase global demand for electricity by the entire capacity of the U.S., the EU and Japan combined, unless there are significant improvements in the efficiency of the equipment. Currently, electricity used for cooling in the U.S. alone is nearly equal to the entire energy demand from the African continent! Under the IEA’s baseline scenario the worldwide number of cooling units (air conditioners, fans and dehumidifiers) is expected to rise from 3.4 billion in 2016 to 8 billion by 2050. About 2 billion new air-conditioning units are expected to be installed in China and India alone, with significant growth also in Africa where usage today is low. The result in that scenario would be a tripling in global demand for electricity for cooling, from 2,020 terawatt hours in 2016, to 6,200 TWh in 2050, with half the global increase coming from just three countries: China, India and Indonesia. We will tackle how to invest for that soaring electricity demand in a future issue of Growth Stock Confidential. For now, let’s just tackle the soaring demand for air conditioners with our selection of the world’s biggest manufacturer. It's not gold, crypto or any mainstream investment. But these mega-billionaires have bet the farm it's about to be the most valuable asset on Earth. Wall Street and the financial media have no clue what's about to happen... And if you act fast, you could earn as much as 2,524% before the year is up.